I’ve heard everything from “Battle of the Uniteds” to the most recently dubbed “Expansion Derby,” but however you slice it, the second week of MLS has arrived and our new expansion club went to Minnesota to face the other expansion club, Minnesota United. The one downfall in having an outdoor stadium in Minnesota is the weather. Earlier in the week, we expected a chilly match and we received it; a 28-degree afternoon with a snow-covered pitch. Atlanta was managing surprisingly well given the circumstances. They established themselves as a possession side during their first match under Tata Martino and they continued their trend today. The goals came early in this match with two goals from Josef Martinez and a beautiful left-footed effort from Miguel Almirón. Our South American contingent was looking very tight and compact in this match. It appeared as if those first game jitters were long gone. Atlanta United players celebrate their first three goals. Atlanta was vulnerable in one visible area that Minnesota exploited and that was the counterattack. With the wingers (Tyrone Mears and Greg Garza) pushing up the pitch so often, one mistake would lead to a counter by Minnesota leaving only Michael Parkhurst and Leandro González Pírez to defend. Thanks to the pace of our midfield and some readjusting, this problem was rectified by the end of the half. Kevin Molino nabbed Minnesota’s first goal off of a penalty from Jeff Larentowicz in the box. Within the first 30′ of the match, we had already seen four goals. got the win tonight and it feels really good to get the first win in team history,” Martinez noted about his hat-trick. 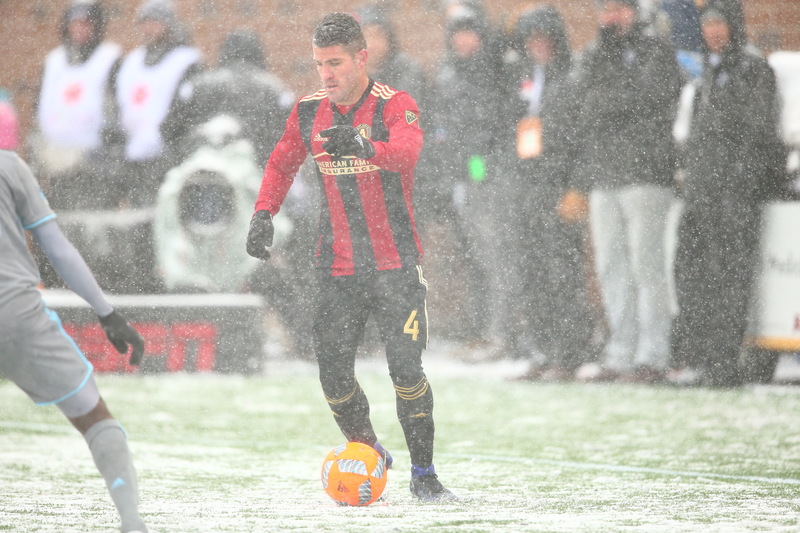 Atlanta United’s Greg Garza had his hands full on the wings in the in climate weather. If that wasn’t bad enough, substitute Jacob Peterson received a beautifully lobbed ball from Greg Garza to head in Atlanta’s sixth goal of the evening. Our South American contingent will truly be what separates Atlanta United from the rest of the league. The play of Miguel Almirón, Josef Martinez, Leandro González Pírez, Tito Villalba, and Yamil Asad told the tale of dominance in today’s match. The aggressive play of Pírez on the backline, the possession of Almirón, the positioning of Asad, the vision of Villalba, and the deadly runs by Martinez saw Atlanta United dominate this match. Remember those names as they will be the story of the franchise for weeks to come. So Atlanta United come out on top of the Expansion Derby 6-1 winners. They will face Chicago Fire at home this Saturday at Bobby Dodd Stadium in Atlanta. Tata should be pleased with his team’s performance today.